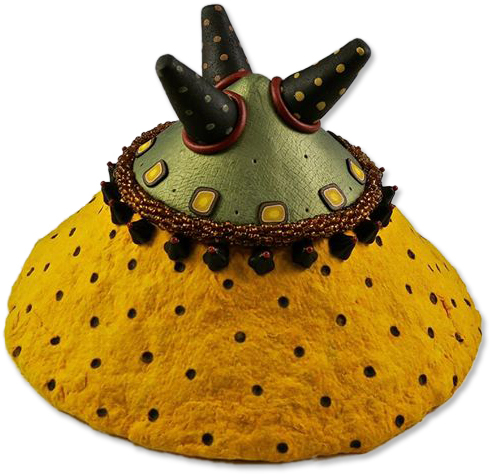 Virginia’s Angie Wiggins mixes handmade paper, felt, beads and polymer with colorful abandon and an embroiderer’s precision. Following her on Facebook will give you the latest news about her creations. The pattern and texture pictures posted on her Pinterest boards show what catches her eye and influences her choices. After she embroiders beads and polymer slices onto the bowls, Angie often elevates her vessels with a tripod of whimsical polymer legs. 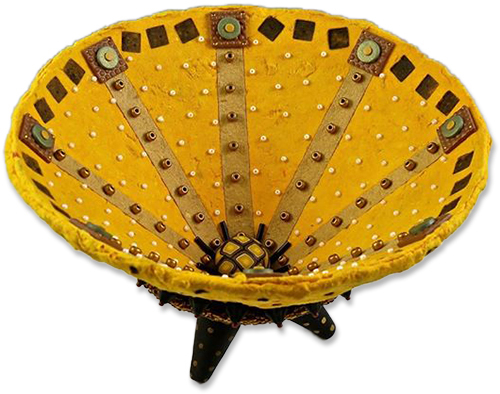 When she tires of bowls, she moves to platters or switchplates or buttons or jewelry – all with her signature mix of sewn-on delights.